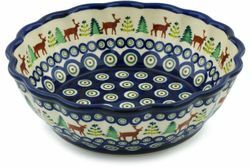 Fluted Bowls: This Polish Pottery Fluted Salad bowl is ideal for serving your salads or chips. This bowl is beautifully decorated both inside and out and makes a stunning centerpiece. The subtle fluting adds yet another artistic element to this pottery bowl.